Ohh, this was a good one! The chipotle peppers give this soup a smoky smooth flavor. It’s a nice departure from the normal corn chowder. But, beware. The first bite of the soup isn’t spicy, so you might be tempted to add more chipotle. Be ye warned – it gets progressively spicier as you eat it. In the end, I felt feel somebody kicked me in the tastebuds. And I liked it. 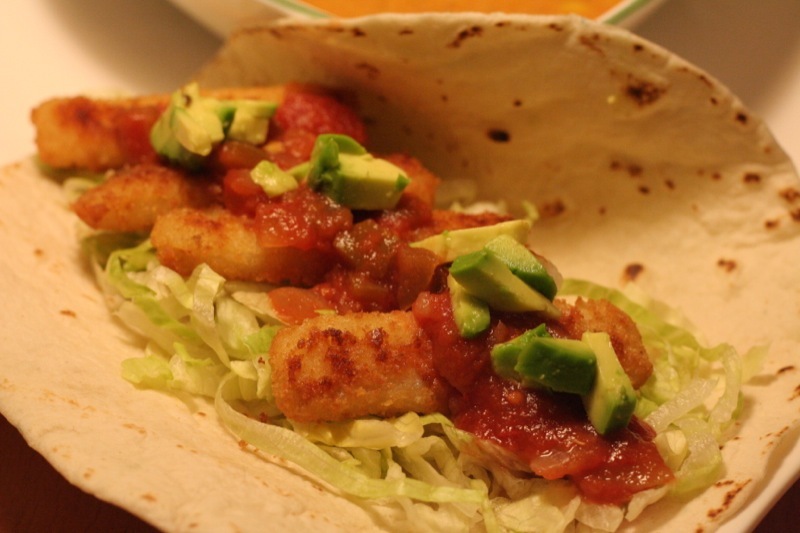 The fish tacos couldn’t be easier. Why? They’re made of fish sticks! Gasp! Cheating! I know. 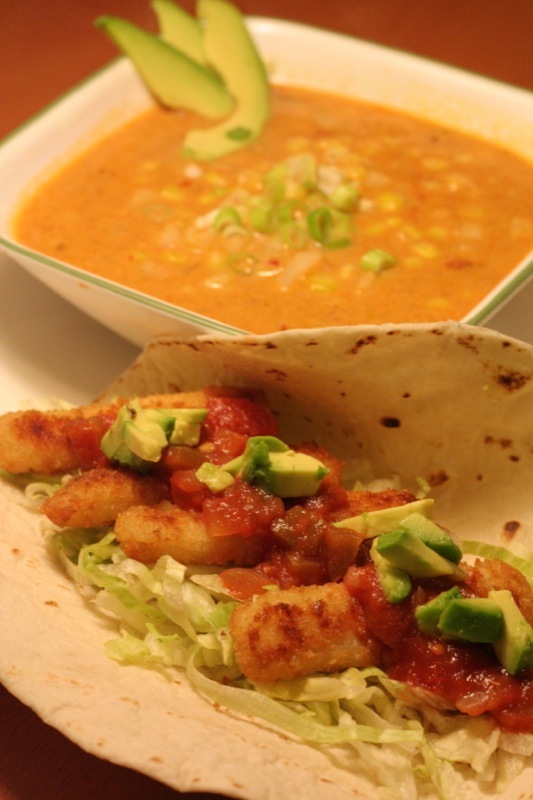 Fish tacos from frozen fish sticks? What? But they taste good, and they’re quick. All you have to do is fancy them up a little with some salsa. Don’t take away my foodie license. I’m in law school. And Jamie Oliver does it too. 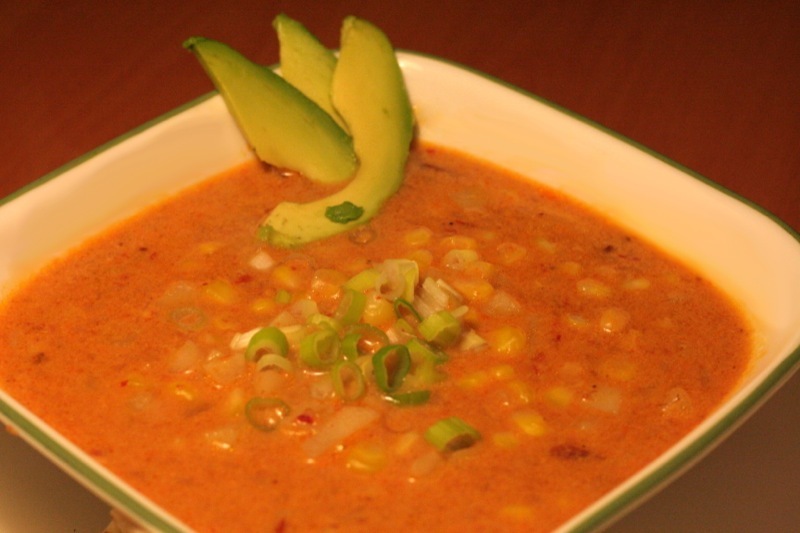 I based this soup on this recipe, but added more corn and chipotle peppers. 1. Melt some butter and olive oil in a soup pot and saute the onion and garlic until soft. 2. Add the potatoes, salt, and pepper and let it cook for a few more minutes (this will make it cook quicker later). Add the corn, stir well. (Maybe leave the corn out for a few minutes before this so it doesn’t go in frozen). 3. Pour in the liquids. Let the mixture come to a medium boil, then bring it back down to a simmer. 4. Puree the chipotle peppers and a couple spoonfuls of the sauce (or mince finely) and add it to the soup. 5. Simmer the soup for about 15 minutes, until the potatoes are tender. Oven-bake fish sticks as directed on package. On a warm tortilla, spread shredded lettuce and four fish sticks. Top with salsa, chopped avacado, tomatoes, cilantro, sour cream – whatever you want!